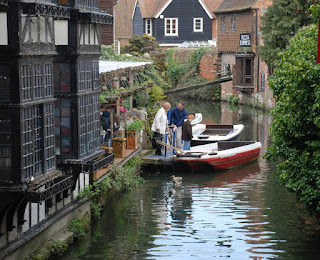 Yesterday I went to a tour in the River Stour in Canterbury. The guide, a guy called George, was very knowledgeable about the history of Canterbury and provided us with an excellent and detailed account of many events and background of all the places we went past during the tour. If you fancy going in one go to The Weavers and over the bridge you will find someone selling tickets for the tours. It costs £6.50 per person (please tip the boys!) and departures every 15-20 minutes. They don't operate in winter. I have enjoyed taking a look at your photography post today. The narrative is nice. This looks lovely and like so much fun! I wanna do that! I wanna do that! That's exactly the kind of thing O like to do when I travel. And this places looks so adorable! Thank you Abraham and Professor. I'll come with Monica and we'll all go. This is just the kind of thing I love, and Canterbury looks so beautiful. Is it all like this, or just the center of town? I imagine there must be shopping malls and parking lots somewhere. I hope they're hidden. It sounds wonderful. I'm so glad the local citizens care enough to preserve the town's charm. As for Unsworth guest house, I come with a husband who eats a lot, so we might have to stay at the B&B and meet up with you and Monica at the boat ride! Monica, all I can say is we will try. I don't think we'll stay from April 'til October, although it would be nice to take such a long vacation!